“How God Appeared In Saxonland” is the first part in what is to be a series about Christianisation in the Netherlands (and abroad). The second part, “How God Appeared In Frisia” is also available by now. 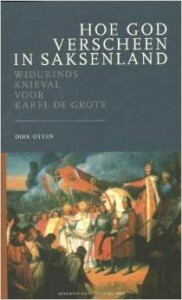 The subtitle of the current book is “Widukinds knieval voor Karel de Grote”; which is a bit hard to translate, but it says how the Saxon leader Widukind was defeated by Charlemagne. This is exactly the story of the book. Charlemagne christianised “Saxonland” with brute force. “Saxonland” is an area that covers a part of the east of the current Netherlands and the adjacent piece of Germany. These Saxons were not exactly keen to turning over to the new religion. They killed missionaries, fought against invading armies and even when Charlemagne raised to power, they remained resistant. When Charlemagne thought his job was done, some Saxon tribe started to attack his troups, throw out Frankish priests and burn their churches, etc. The whole process took a century and a half. Otten needs only 175 pages for his story and these pages include a chronology in the beginning, a translation of the Frankish empirical annals, a bibliography, an index and several pages with images (b/w and colour, many images I had never seen). Still the book is nicely detailed. Also the book is nicely written and (apparently) scientifically solid which makes this a title both for historian scholars and people who are simply interested in the subject. Otten obviously was annoyed by the brutality of the Christianisation of the Saxon tribes which he keeps stressing. The Saxons were not exactly sweethearts either and this become clear as well. The author starts with a summery of the upcoming of the religion of Christianity. Then he says something about the Saxon lands and its peoples. He also spends some pages on the prechristian religion of the Saxons (which he keeps calling a religion in which nature is worshipped, quite an outdated view) based on texts of Roman historians, but also writings from the Church in which heathen habbits were forbidden. Of course there is the Old Saxon Baptismal Vow of the late 8th century and the ‘Saxon Bible’ the Heliand (on which Otten has some interesting notions). There is attention for the most famous missionaries Boniface, Willibrord, Alcuin and Lebuinus about whom Otten wrote a book earlier. The book is purely historical, but there is not a whole lot of literature about his part of Dutch history and it makes a nice read. I guess I will also get the Frisia book as well.